TDS understands that keeping children safe is a priority for parents. 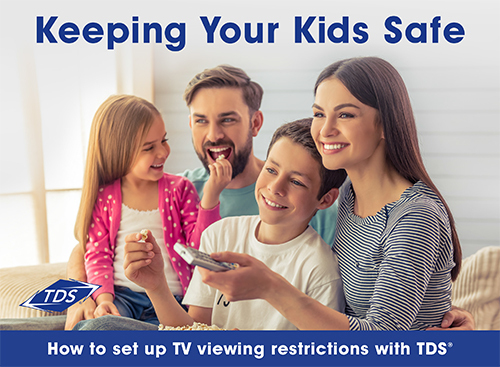 To help parents become better gatekeepers of the content that is broadcast on their TVs, TDS provides its customers a way to set parental controls on their televisions. You can’t always be in the same room as your child when they are watching TV, but you can restrict what they watch. With TDS, every TV subscriber has the ability to set parental controls on their television. Lock inappropriate channels: With TDS, you can lock any channel you want with a four-digit pin. Lock shows with specific ratings: Parents can restrict shows with certain ratings for viewers in their home. Hide show titles: With TDS you can hide the title of a show with an Adult or TV-MA rating. Create a pin: To lock programming, you use a four-digit pin. To set up your pin, press MENU on your remote control. Select the first option, Parental Controls, and create your pin. Set your restrictions: Once you have a pin, you can choose which content you want to lock. Press MENU and your remote and select Parental Controls. On the right, you will see options to: lock specific channels, lock shows and movies with certain ratings, hide titles with an Adult or TV-MA rating. Forget your pin? Not a problem. Contact TDS and we’ll reset your pin back to its default mode and you can enter a new pin code. Create a pin: Go to Settings, scroll down and select Parental Controls. The first time you’re here, you’ll be asked to create a four-digit pin. Set your restrictions: Once you have a pin, you can choose your level of restrictions in the Parental Controls card. You can lock specific channels or content by its TV or movie rating. Unlock for specific amount of time? Parents with Catch TV can also unlock Parental Controls for a specific amount of time. For example, if your children are in bed and you want to browse channels and not enter your pin every time you select a show that’s PG-TV, you can unlock your Parents Controls settings for up to six hours. To help you understand the TV rating systems, here is the list of ratings. Please note these guidelines are not used on sports or news programs or during commercial advertisements.